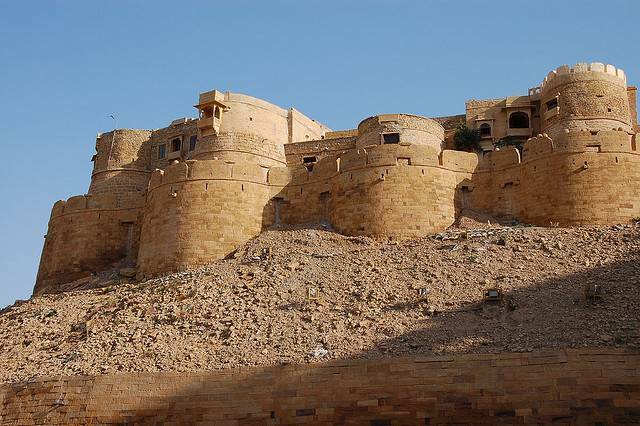 Jaisalmer Fort also known as Sonar Quila or Golden Fort was built in 1156 AD by Rao Jaisal, the town is dominated by a large, imposing and fine example of a city fort. Often referred to as the ‘Golden Fort’, Jaisalmer is one of the world’s largest still in working order. The fort has a great and rich history, spanning through invasion, conquest, loss and re-conquest. Housed within the structure are a number of attractions such as the Raj Mahal (Royal palace), Jain temples, Laxminath temple, its four main gateways plus the Havelis which are discussed further in this guide.